Terror is about to surface! Prepare for a close encounter of the terrifying kind! 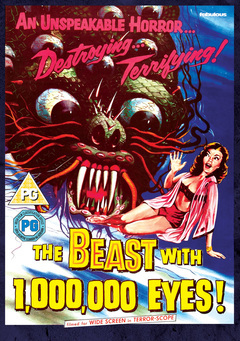 Extra-terrestrial terror is keeping an eye out for human flesh in this horrifying tale of invasion! After a strange craft crash lands near a ranch home in the California desert, the rancher’s family believes the danger has passed. But when they are attacked by animals driven into a rage by the alien force, they realise that something did survive the crash...and it’s hoping to take in it’s first meal on Earth...ranch-style! Paul Birch, Lorna Thayer, Dona Cole.